Researchers have created heart muscle cells called cardiomyocytes from induced pluripotent stem cells, or iPS cells. These lab-made cardiomyocytes can then be used to test chemotherapy drugs for potentially heart-harming side effects. 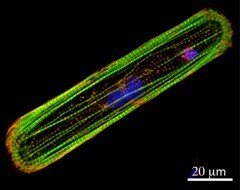 This image shows an iPSC-derived cardiomyocyte. Proteins that are important for muscle cell contraction are highlighted in red and green, and cell nuclei are blue.